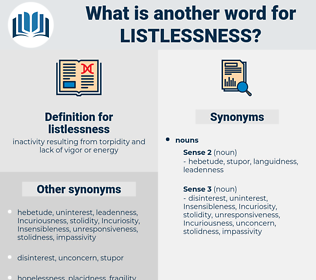 What is another word for listlessness? eagerness, relief, fascination, entertainment, wellness, keenness, stoutness, huskiness, enterprise, healthiness, beguilement, heftiness, bewitchment, vitality, spiritedness, enthusiasm, hardness, captivation, involvement, diversion, toughness, energy, enchantment, animation, invigoration, absorption, hardihood, ruggedness, engrossment, fitness, robustness, strength, ambition, vim, enlivenment, sturdiness, health, vivacity, lustiness, hardiness, immersion, amusement, soundness, stimulation, Brawniness, vigor, virility, Muscularity, excitement, engagement. Dingy soldiers everywhere, dirt, decay and deprivation everywhere, listlessness and laissez - faire on the surface, with unrest and upheaval below. They all lift up their heads from their listlessness.